Forts of the Civil War Era. —. Fort Howell is typical of the earthen forts constructed during the Civil War by both Confederates and Union Armies. The change from earlier brick and stone masonry forts was the result of advances in weaponry that occurred as the Civil War approached. Rifled cannons came into use, and with their increased range, power, and accuracy over previous smoothbore cannons, they could easily breach the older style masonry fort walls, as seen in the photograph of Fort Pulaski below. The dirt walls of the Civil War earthen forts could better absorb incoming rifled artillery shells and protect the men and weapons inside the fort. Fort Howell is typical of the earthen forts constructed during the Civil War by both Confederates and Union Armies. The change from earlier brick and stone masonry forts was the result of advances in weaponry that occurred as the Civil War approached. 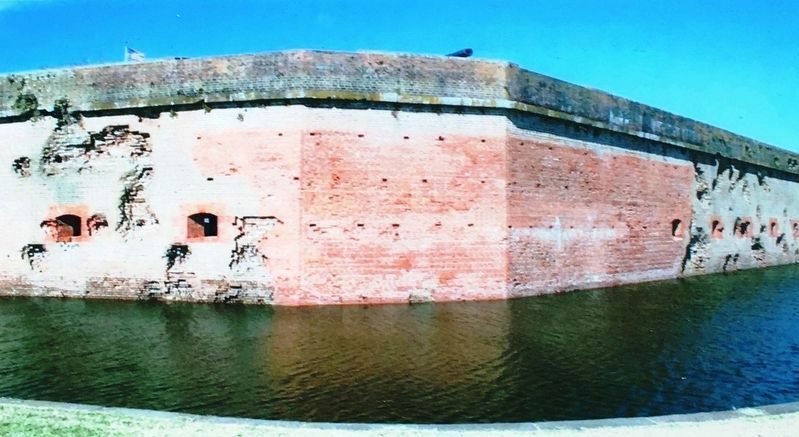 Rifled cannons came into use, and with their increased range, power, and accuracy over previous smoothbore cannons, they could easily breach the older style masonry fort walls, as seen in the photograph of Fort Pulaski below. 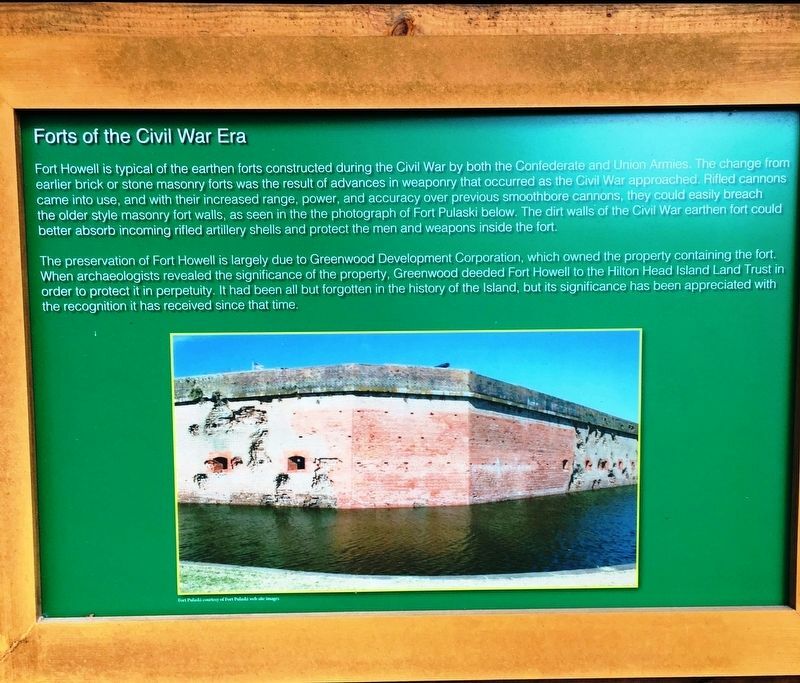 The dirt walls of the Civil War earthen forts could better absorb incoming rifled artillery shells and protect the men and weapons inside the fort. The preservation of Fort Howell is largely due to the Greenwood Development Corporation, which owned the property containing the fort. 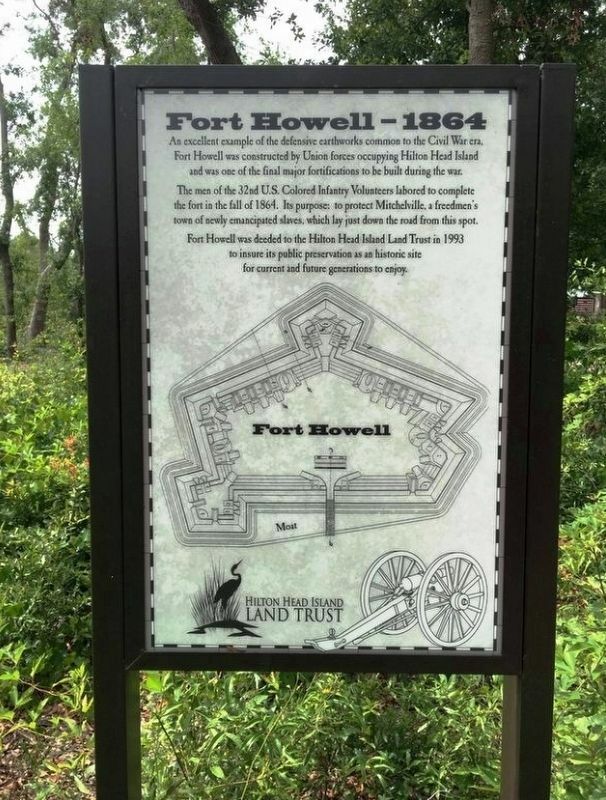 When archaeologists revealed the significance of the property, Greenwood deeded Fort Howell to the Hilton Head Island Land Trust in order to protect it in perpetuity. It had been all but forgotten in the history of the island, but its significance has been appreciated with recognition it has received since that time. Location. 32° 13.964′ N, 80° 41.64′ W. Marker is in Hilton Head Island, South Carolina, in Beaufort County. Marker can be reached from Beach City Road 0.1 miles south of Dillon Rd.. Touch for map. Marker located inside Fort Howell Historic Park. Marker is at or near this postal address: 160 Beach City Road, Hilton Head Island SC 29926, United States of America. Touch for directions. Other nearby markers. At least 8 other markers are within walking distance of this marker. General Howell / Captain Suter (here, next to this marker); The Troops that Built Fort Howell / Camp Baird (here, next to this marker in Florida); The Story of Fort Howell (a few steps from this marker); Fort Howell - 1864 (approx. 0.2 miles away); Fort Howell (approx. 0.2 miles away); Mitchelville Site (approx. 0.2 miles away); St. James Baptist Church (approx. 0.2 miles away); Cherry Hill School (approx. 0.2 miles away). Touch for a list and map of all markers in Hilton Head Island. 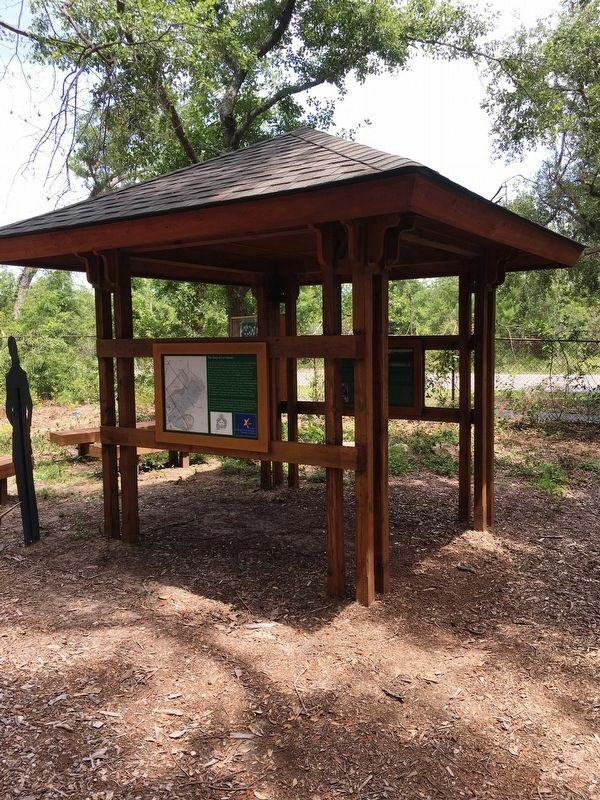 Forts of the Civil War marker is attached to this covered pavilion located within Fort Howell Historic Park. An excellent example of the defensive earthworks common to the Civil War era. 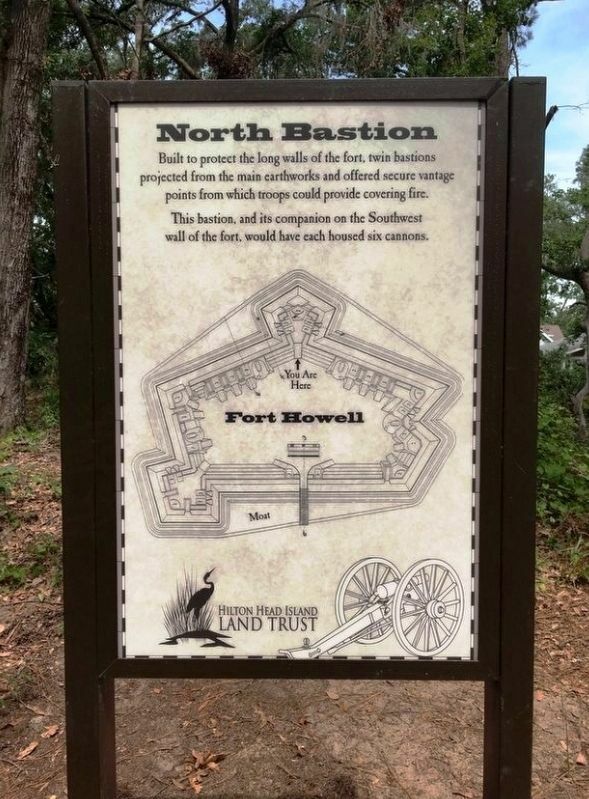 Fort Howell was constructed by Union forces occupying Hilton Head Island and was one of the final major fortifications to be built during the war. The men of the 32nd U.S. Colored Infantry Volunteers labored to complete the fort in the fall of 1864. Its purpose: to protect Mitchelville, a freedmen’s town of newly emancipated slaves, which lay just down the road from this spot. 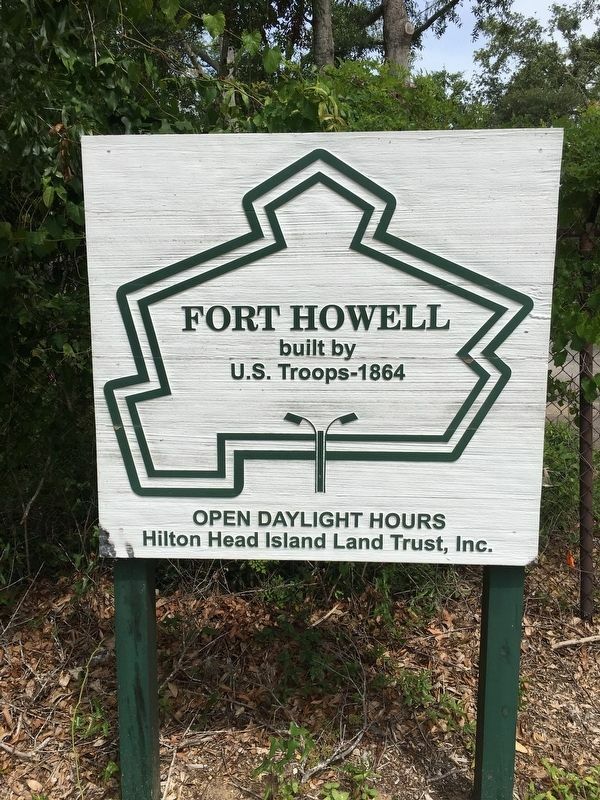 Fort Howell was deeded to the Hilton Head Island Land Trust in 1993 to insure its public preservation as an historic site for current and future generations to enjoy. Built to protect the long walls of the fort, twin bastions projected from the main earthworks and offered secure vantage points from which troops could provide covering fire. More. Search the internet for Forts of the Civil War Era. Credits. This page was last revised on April 9, 2019. This page originally submitted on April 7, 2019, by Brandon D Cross of Flagler Beach, Florida. This page has been viewed 43 times since then. Photos: 1, 2, 3, 4, 5, 6. submitted on April 7, 2019, by Brandon D Cross of Flagler Beach, Florida. • Andrew Ruppenstein was the editor who published this page.